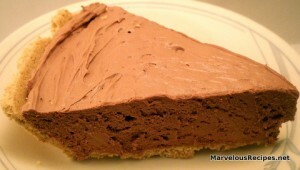 If you love chocolate, if you love cheesecake, then you are sure to enjoy this smooth, creamy, rich and yummy dessert! You won’t believe how simple it is to make! 1. In a large bowl, beat the cream cheese, butter, sugar and vanilla extract until smooth; beat in the melted chocolate. Fold in whipped topping; blend well. 2. Spoon mixture into crust. Cover and chill until ready to serve. Makes 8 servings. That sounds delicious and looks very easy to make. Wow, that’s almost too easy! I can just imagine that smoosh sound it makes when you bite into it. YUM! I am thinking of making this. I am not sure when. It is too good for everyday. If I make it, I will hopefully remember, to let you know.